Do I need to have a missed period before my appointment? Yes, and here’s why! Before you come in for a pregnancy test, ThriVe® asks you to be 28-31 days from your last period. This is to help ensure that your pregnancy test result is accurate. It generally takes the time of a missed period for this hormone to show up. Learn more about pregnancy options including abortion, adoption, & parenting. 100%. ThriVe® has a strict confidentiality policy. We will not tell anyone about your visit with us, unless you give us permission to do so. When you walk into ThriVe®, you can be assured that we will do all we can to protect and respect your privacy. If you are concerned about confidentiality, you can talk to our center director personally. She will work with you to set up a time that you feel safe and comfortable with. ThriVe® will hold in confidence all the information that you provide except in these situation: if you are homicidal, suicidal, under age and being abused, or abusing someone else. We are required by state law to report such instances. Walk-ins are welcome for pregnancy tests. If there is an available appointment, we will work with you to add you to the schedule. While walk-ins are welcome, we suggest scheduling an appointment to minimize your wait time! All of our services are provided at no/low cost. Can I get birth control there? 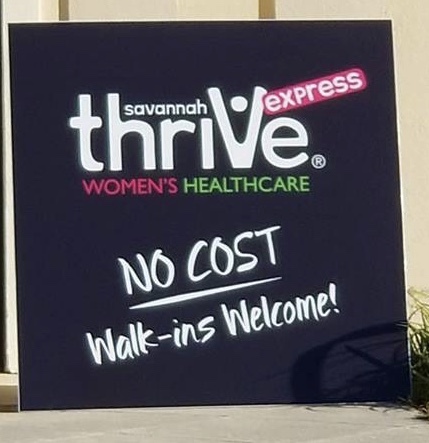 ThriVe® does not prescribe birth control. Can I get Emergency Contraception there? ThriVe® does not provide emergency contraception (Plan B).